Jaguar Mark X Overshadowed somewhat by the launch of the E Type, Jaguars saloons had also undergone substantial redevelopment at the beginning of the sixties. To replace the ageing Mark IX, the Mark X was introduced in October 1961 as the first of a new generation of Jaguar saloons. In some respects it was similar to the E Type in that it used a wider version of the new independent rear suspension, with front suspension along similar lines established by the smaller saloons. The Mark X used the same 265 bhp engine as the E Type, but with the Mark IXs transmission options. The most significant dimension of the new saloon was its width. 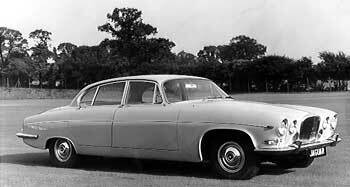 At 1,930 mm it was one of the widest cars ever made in Britain. The interior was similar to the Mark 2, although on a much bigger scale, making the Mark X a full six seater. Its rear end was also redesigned to make the luggage boot extremely large. Because of the power of the E Type engine, the Mark X was still capable of nearly 120 mph despite its weight of 1,880 kg (4,144 lb). Extensive use was made of rubber mountings to keep down the road noise. The appearance was thoroughly modern, with new slim line bumpers and a four headlamp system. The mark X sold reasonably well, but it was not an outstanding success in terms of sales, partly because the Mark 2 was in such demand and partly because it seemed too big for European roads.